St. Louis University Hospital Workers Celebrate Our Hard Fought Contract Victory! St. Louis University Hospital’s bargaining committee celebrates our tentative agreement on Jan. 10th. 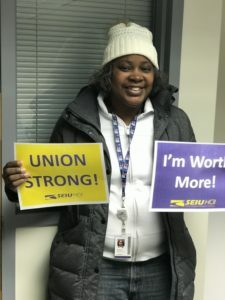 2019 after our contract campaign that saw incredible improvements for our workers. 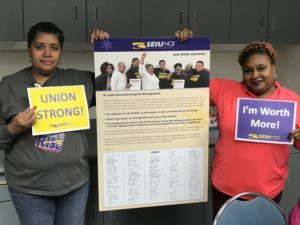 (January 15th, 2019, St. Louis) –– St Louis University Hospital workers approved our new contract by a stunning 189 votes in favor and just 15 votes against in ratifying our collective bargaining agreement. 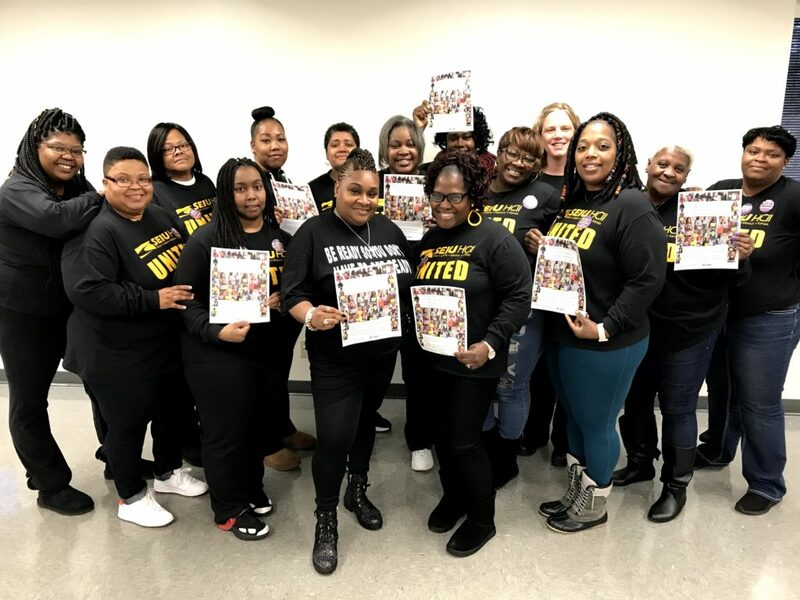 The bargaining team consisted of a total of 17 women working hard, and keeping the committee unified. “on-call”, travel pay, and PTO, as well as resources for better training and professional development. Our members received some huge gains in our new contract, including a 2.5% raise after the first full pay period after April 1st, 2019 – and then subsequent 2.5% raises in 2020 and 2021. PRN employees shall receive an increase of 1% on April 1 of each contract year. An estimated 57 employees will receive an equity increase up to $3.93, and eight other employees will receive an equity and longevity increase to honor their service. Our Care Partners and ED Techs are now eligible for $.50 per hour for all hours spent training or orientating another employee. Full Time employees are eligible for $1000 in a Professional Development. Employees can use these funds for reimbursements for tuition or conferences. Funds cannot be used towards certifications, re-certifications, registrations and/or licenses required as a condition of employment for their current position. In December 2018, SLUH workers march on the boss to deliver an open letter and demand a fair contract. • Pay is increased to a minimum of $2.50. No on-call pay will be reduced. • Employees called into work will be guaranteed two hours of work. • The hospital shall provide access to an on call space with a bed, stretcher, or cot with access to a bathroom for any employee who is work on call, upon their request. When possible employees shall have access to a shower. • There shall be designated parking for employees called in for on call between 6AM and 3PM Monday through Friday. Travel Pay: An employee who is called back to the worksite will receive one hour of travel with each call back if an employee is not already at the worksite and the employee has been clocked out for 30 minutes for more. ALL Employees shall be given 8 hours of rest. Employees (including those on-call) working a 12 or 16 hour shift and work beyond their shift shall be given a mandatory rest period of 8 hours. (unless they waive this option). On Call employees called in before the beginning of their next shift shall be given the option to leave early. Workload: SSM will post in each work area a chain of command so as to address concerns of work assignments. When an employee is assigned to do work functions as a result of a floor or department having less staff then scheduled they shall take direction from their supervisor as to prioritize the work that needs to be done. • PTO is now earned on all hours worked up to 80 hours. • Employees can cash out PTO up to two times a year up to a maximum of 80 hours. • Employees shall be allowed up to 24 hours of unpaid PTO a year. Any additional unpaid time off shall incur an occurrence. The assignment of the occurrence can be waived in exceptional circumstances at the discretion of the Hospital. The new contract also greatly improved discipline policies such as removing a discipline report from a worker’s file after 12 months; discipline must be given within 30 days; and finally the agreement streamlined the grievance procedure.